In one of the biggest tests for Josh Pastner’s fledgling basketball program, the Jackets will take on the UCLA Bruins Saturday, Nov. 10 in Shanghai, China as the Pac-12 China Game presented by the Alibaba Group. Tech, coming off a hot start to Pastner’s tenure, will open the regular season overseas against an opponent it has not faced since 2006. Tech enters the game after losing star sophomore Josh Okogie during an exhibition match against Georgia State University last Saturday, when Okogie suffered an open dislocation of his index finger. Pastner indicated that Okogie could expect to be out for “a while”, courtesy of MyAJC.com. But no timeline for Okogie’s recovery has been announced or released. Pastner did indicate on Thursday that Okogie would miss Tech’s season opener. Freshman Curtis Haywood is likely to take the floor in place of Okogie. Haywood played 32 minutes against GSU, putting up three points, four rebounds and one assist. He will look to improve those figures moving forward. Instead of Okogie, Tech will have to rely heavily upon Ben Lammers, the senior center who won ACC Defensive Player of the Year last season. Lammers averaged almost a double-double last season with 14.2 points and 9.2 rebounds per game, and finished third in the country in blocks per game (3.4). 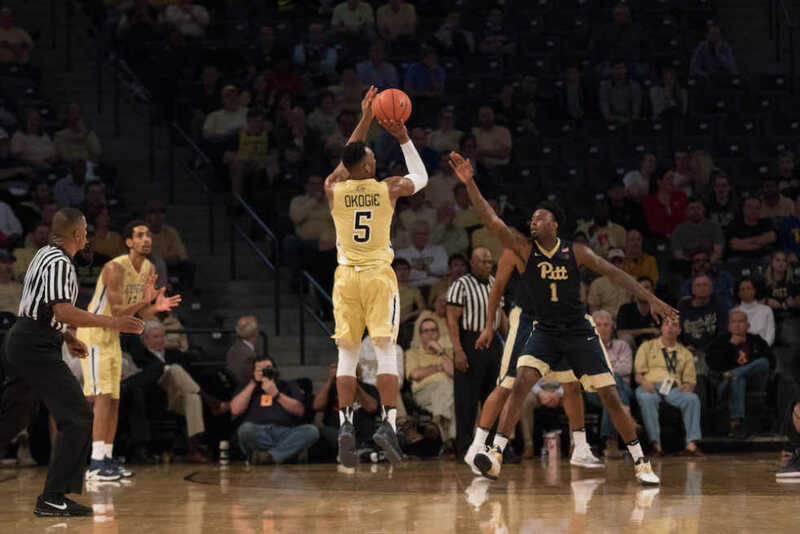 Lammers will be complimented by Tadric Jackson, who showed significant improvement in scoring last season and looks to continue the trend this year. Tech will face off against UCLA, a perennial college basketball powerhouse. UCLA has notched eleven NCAA championships in its history, a record, and has produced some of the greatest NBA basketball players of all time, including Kareem Abdul-Jabbar, Bill Walton and Reggie Miller. Former Bruins coach John Wooden is widely considered to be the greatest college basketball coach of all time, leading UCLA to ten titles. UCLA’s recent history has continued this trend of greatness, reaching the Sweet Sixteen in the NCAA 2017 March Madness Tournament and sending point guard Lonzo Ball to the NBA as the second overall pick in the 2017 NBA draft. Led by Coach Steve Alford, they rebounded from a disappointing 2015-2016 season in which they posted only their fourth losing season since 1948 to go 31-5 in 2016-2017, finishing the season ranked No. 8 overall in the country in the AP Top 25 poll. UCLA enters the Pac-12 China Game ranked No. 21 in the country overall after graduating a considerable amount of talent, but the Bruins still look poised to compete after bringing in some top-tier freshmen talent, including point guard Jaylen Hands, ranked as the No. 3 PG in his recruiting class, and Lonzo Ball’s younger brother LiAngelo Ball, a forward guard. The Bruins’ involvement with the Ball family has drawn national attention recently, thanks to LaVar Ball’s outspoken nature. Ball received heavy media coverage for claims regarding his son Lonzo, saying that his son was a better basketball player than two-time NBA MVP Stephen Curry (among other remarks). The elder Ball has been much more tempered with his remarks regarding current UCLA player LiAngelo, saying that he believes LiAngelo is the least likely of his three sons to make the NBA. UCLA brought in another strong class of freshmen — their recruiting class was ranked No. 4 in the country by ESPN, including Ball, Hands and five-star-prospect Kris Wilkes. UCLA is expecting to rely on their freshmen for significant minutes in addition to returning players Aaron Holiday and Thomas Welsh, but the uncertainty in performance from unproven freshmen means that expectations for the Bruins are tempered entering 2017-2018, though the sheer talent alone might carry UCLA deep into the playoffs later this season. Tech has played the Bruins only four times in their history. They most recently played in 2006, when the Bruins defeated the Jackets 88-73 in the championship game of the Maui Invitational Tournament. Tech has only defeated UCLA once before, beating the Bruins 72-67 in 2000. The Jackets will take on the Bruins at Mercedes-Benz Arena in Shanghai at 11:30 p.m. EST on Nov. 10. The game will be broadcast nationally on ESPN. The game is an early-season contest, so while there may be significant temptation to react strongly to the outcome, it is important to keep expectations rational. The Jackets will play without arguably their best player. They must replace two very experienced players from their 2016-17 lineup with two unknowns. They face a Bruins squad loaded with top-notch talent and looking to establish itself as a contender in the NCAA Tournament. No, the Jackets will probably not leave Shanghai with a win. But a competitive game will do wonders for the team’s confidence (not to mention recognition abroad). Should they manage to come out on top against Steve Alford’s team, it would be an impressive start indeed.